Emir of Qatar Sheikh Tamim bin Hamad al-Thani Tuesday said Qatar’s economy has grown stronger despite the sea/air/land blockade his country has been facing for over one year as a result of diplomatic rift with four Arab countries, led by Saudi Arabia. In a speech to the Consultative Assembly, he underscored that Qatar’s economy is still solid and witnessed an 18 per cent growth last year despite isolation from neighbors and major regional partners. Qatar has been facing since June last year an unprecedented diplomatic crisis, which has hauled the tiny gas-rich country on the opposite side with its regional neighbors namely Saudi Arabia, United Arab Emirates (UAE) and Bahrain in addition to Egypt. 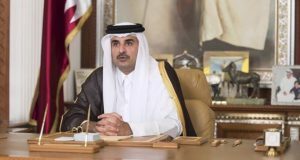 The four countries accused Qatar of supporting terrorism and they imposed the blockade, which cut off food and major basic amenities supplies to Doha. Qatari authorities have rejected the charges and claimed the country was victim of smear campaign. Sheikh Tamim also noted that the government slashed spending by 20 percent. Qatar’s currency has preserved its value since the start of the rift last year and the economy has diversified to overcome the impact of sanctions imposed by other Arab states, he added. As of the rift with the boycotters, the ruler said it will pass. Written by: KanelkaTagba on November 6, 2018. Posted by KanelkaTagba on Nov 6 2018. Filed under Gulf News, Headlines. You can follow any responses to this entry through the RSS 2.0. Both comments and pings are currently closed.